Kevin White is the author of Fullhouse Touch - a free puzzle app game for the iphone & ipad. The black dots are walls. 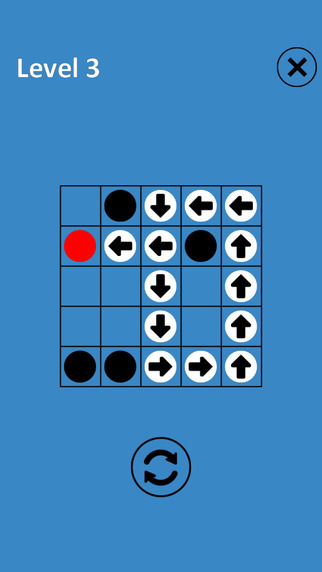 Your objective: place the red dot anywhere on the board and fill the board with arrows completely. Look at the second image. The red dot must travel to the left and will not stop until it hits a wall. Then it must go up, right, up, right, down and right to complete the puzzle. The essential questions: where is the starting point and where is the endpoint? Sometimes, neither is evident. There's a lot of trial and error. What could be better: there is no undo button. Which means you have to start all over again. Also, ads pop up after you solve each level, but not when you restart a level. Mortal Coil - this is a much better version. For a variety of reasons. Stroke! - this version is similar but adds a color matching scheme that makes it devilishly hard.